Let's look at these six reasons that God gives and see if we can see any continuity and logical progression. (1) "To finish the transgression" refers to the "transgression" of Daniel's people. The word carries with it the idea of rebellion and speaks of the spiritual rebellion of the Jews against God by rejecting His Son as their Messiah. Today, they are still in that rebellion, but they will finish it before the 490 years are completed. In other words, by the end they will recognize Jesus as their true Messiah. (2) Secondly, when they accept Jesus as their Messiah at the end of the 490 years, it will bring their sinfulness (all their acts of sin) to an end as they enter into a perfect relationship with Christ in His 1000 year Millennial reign of peace, justice, and righteousness. (3) That established relationship with Christ will bring about their reconciliation with Him. It was their iniquity that separated them from Him, but Jesus provided the means for their reconciliation when He died on the cross. But, of course, that reconciliation will only happen when they accept what Jesus did for them and recognize Him as their true Messiah and Savior as noted in (2) above. (4) Once the Jews are saved and reconciled to Christ, they will be ushered into His Millennial Kingdom which will initiate their "everlasting righteousness" under His leadership and Lordship. These first four reasons for the 490 years that God will deal with the Jews all say basically the same thing... that God is going to ultimately bring Daniel's people into a righteous, everlasting, relationship with Himself. (5) The 490 years will conclude with the completion of the last seven years of it that at this time are still futuristic. That seven years is what we usually refer to as The Tribulation and it will climax with the glorious return of Jesus Christ as the King of Kings and Lord of lords. This Glorious Appearing will complete (fulfill) the vision that God was giving to Daniel about the Lord's Second Coming. It will from thenceforth be "sealed" as a historical event. (6) The "anointing of the most Holy" can mean a couple of things. It could refer to the coronation of Jesus as the king of all the earth. Or, it could refer to the anointing by Christ of "the most holy place" in the new Millennial Temple. In fact, these two events could be part of the same event... the ascension of King Jesus to His new earthly throne. In either case, it will signify the end of the old world system and the inauguration of the new Millennial era. (1) It is all about how God is going to deal with DANIEL'S people, the Jews. It is NOT about the Church. It is not FOR the Church. In fact, it has nothing at all to do with the Church since the Church will be raptured before the final seven years begins. (2) We might summarize the six reasons that God lists in Daniel 9:24 as simply saying that He is going to bring the Jewish people to the end of themselves so that they will in desperation cry out to Him for salvation and then, He will save them and establish an everlasting righteous relationship with them. Next, Daniel is told that the 490 years would begin with "the going forth of the commandment to restore and to build Jerusalem" and that it would be broken into three segments of time. First, there would be seven weeks of years (49 years), followed by sixty-two weeks of years (434 years), and then one final week of years (7 years). Next, it says that the first 483 years (the first two segments, 49+434=483) would expire when Messiah shall be "cut off, but not for Himself" (vs. 26). This, of course, is a reference to the crucifixion of our Lord. This will leave only seven years to complete the 490 years that God said He was going to deal with the Jews. 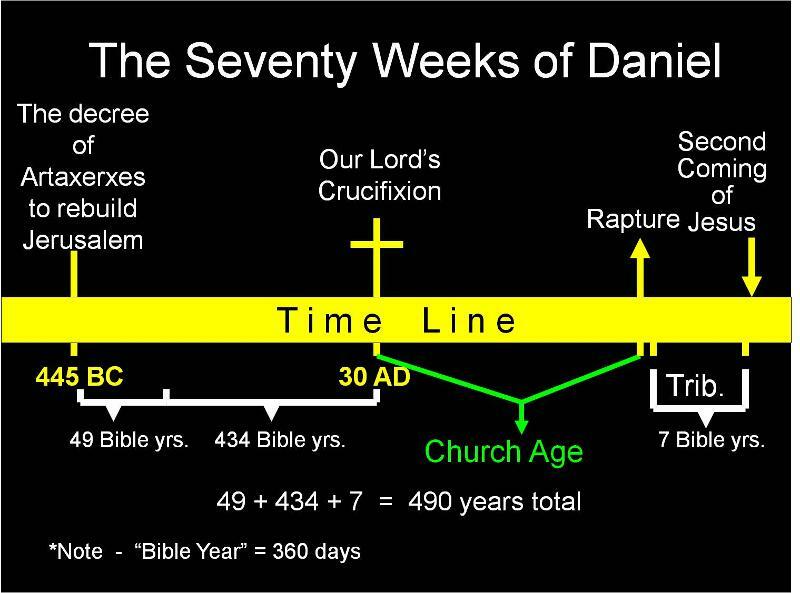 And that final seven years (which has not yet happened) is often referred to as "Daniel's seventieth week" or more commonly, The Tribulation. But why would God divide the 490 years into three segments of 49, 434, and 7 years? What is the purpose of these three periods? Perhaps the best way to determine that answer is to decide what was (or will be) the primary thing happening to the Jews in each of those periods that will ultimately accomplish the reasons that God listed for the whole 490 years. As previously noted, the whole 490 years began with "the going forth of the commandment to restore and to build Jerusalem". Although there were three decrees made for the Jews to return, the first two were granted for them to rebuild their Temple. It was only the last decree given by the Persian King Artaxerxes in 445 BC to Nehemiah that was specifically to rebuild the city (Nehemiah 2:1,5). From the specifications of the decree, the 490 years began with the restoration of the city. According to Ezra 6:15, the reconstruction of the Temple had been completed in 516 BC, some71 years earlier. So, this time period was not characterized by the reconstruction of the Temple. And even though Nehemiah 6:15 says that the city wall was built in just 52 days, undoubtedly the reconstruction of the city as a whole took many years. So, it might be surmised that the first 49 year segment was the time of RESTORATION. About 400 years exist between the end of the Old Testament and the beginning of the New Testament. This covers the time of the Greek Empire of Alexander the Great which was eventually divided to four of his generals. This four-way division in which the land of Palestine was alternately dominated by the Seleucid dynasty of Syria to her north and the Ptolemaic dynasty of Egypt to the south eventually led to a brief period of Jewish rebellion and relative independence (the Maccabean Revolt) until the Romans took control. The intertestamental time was characterized by the intrusion of pagan Hellenistic beliefs (Greek mythology) among the Jews and the mixing of the religious system with the governing political system which led to widespread religious corruption and apostasy. These centuries are also often referred to as the "silent years" between the testaments when no true prophets were preaching God's message to Israel. So, we might summarize those centuries leading up to the First Advent of our Lord as a day of SPIRITUAL DECLINE. The greatest depths of this depravity were reached when Jesus, bringing His message of forgiveness and salvation, was rejected and crucified. Between the end of those first 483 years and the beginning of the last seven years, we have that parenthetical time period called The Church Age, which is already almost two thousand years long. But when the last person is born again and the "Bride" is complete, the Church Age will be over and Jesus (the Groom) will come for His Bride and whisk Her away to Heaven in that glorious event we call The Rapture. Then, God will resume His 490 years of dealing with Daniel's people. 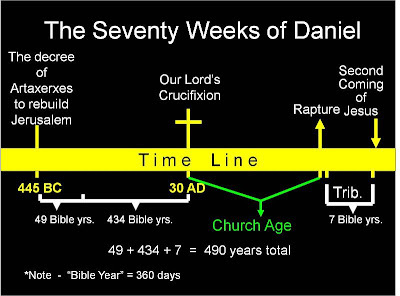 This last seven years is often referred to as Daniel's Seventieth Week, or more commonly as The Tribulation. In the first half of the seven years of the Tribulation, Israel will be allowed to make an alliance with the man of sin, Antichrist. This ungodly reliance on the son of Satan for their peace and security will bring to its pinnacle the apostasy of the Jewish people. It will "finish [their] transgression" and "make an end to [their] sins". In other words, their sin will reach its apex. Notice that the second time segment (434 years) ended with the rejection of Jesus the Christ. And the last time segment (7 years) begins with an acceptance of Antichrist. Then, God will begin a day of unparalleled judgment on the Jews and the whole earth. It will be so bad that Jesus said if those days were not shortened, all flesh would die (Matt. 24:21-22). He refers to the last 3 ½ years of the seven years as the day of "great tribulation". But at the very end, just when it appears that the Jews will be annihilated, they will cry out to God. At that moment, Jesus will make His glorious appearing and save them from imminent destruction. At long last, the 490 years will be complete and God will have accomplished what He said He would. So, the final seven years are characterized by two things... the ultimate completion of Israel's sinfulness, followed by God's judgment that will bring them to the very end of their own resources. And not having anywhere else to turn they will seek their true Messiah, Jesus. Finally, they will be reconciled to Him in everlasting righteousness. After the seventy years of Babylonian captivity, one would think the Jews would have learned their lesson... that they would live in strict obedience to God after that. But their example shows man's unrelenting proclivity to sin. Thus, God is "constrained" to deal with them for one more 490 years of time in order to bring [a remnant of] them into a saving relationship with Christ. At long last, they will be reconciled to God and He will establish His kingdom where they will serve Him in everlasting righteousness. This will complete [seal up] the vision of the "seventy weeks" as unalterable history. And Jesus will be anointed to take His rightful place on His throne as the King of Kings over all the earth. Hallelujah!